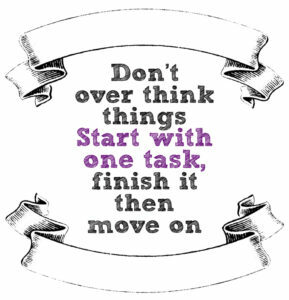 [Monday Motivation] Are you an overthinker? 16 Jul, 2018 in business / comfort zone / Health / income / leadership / monday-motivations / perfectionism / planning / productivity by Minette Riordan, Ph.D. This may be the one thing that is stopping you from finally reaching that sweet spot in your business. You know the spot I mean. The place where clients are flowing in and you are connected to a tribe of raving, enthusiastic fans. That sweet spot where you have all the time you want to be creative and enough income to support your dream lifestyle. The moment where you realize that money is flowing in… whether you are working or not. Does it sound too good to be true? There are many coaches and marketers making the promise that you can have it all, that this dream is real. There are many creative business owners like Brad and I who are living this dream. I know this dream is achievable. Each of these is a face of the same underlying problem: FEAR. Succeed beyond my wildest dreams? You fill in the blank _______________ . Getting stuck in overthinking, perfectionism, and indecision will keep you from finally achieving your goals and dreams. I’ve seen it happen over and over again with creative business owners, they stay stuck for years because of this or distract themselves with busy work and putting other people first rather than making their dream a priority. What’s the antidote? This is supposed to be a motivational email after all. The simple answer: Let go. Make letting go of fear is an everyday practice. Do this with tiny bite-sized actions. No need to leap off a cliff, simply stretch just to the edge of your comfort zone, push on it, expand it. Here’s a personal example. I’m not too happy with my body weight right now. I don’t feel like I have my normal energy, and I don’t look in the mirror every morning with admiration. I’m working on it, it’s a journey for sure. At the same time, I am committed to ramping up my use of video in my marketing, especially Facebook live. I am trying to take more “selfies” and be more visible online. This is challenging when I don’t feel my best but I am doing it anyway. I am sharing selfies on my personal Instagram page. I have been hosting a FB live every week in our Productivity for Creative Entrepreneurs Facebook group. I am letting go of my own self-judgment and criticism, day by day. I am more committed to supporting you, to increasing visibility, and growing my business than I am to hiding here at my desk. What has helped is asking myself this question: Will this choice propel me toward an inspiring future or will it keep me stuck in the past? I love this question! It’s one of 10 powerful questions that Debbie Ford invites us to ask in her brilliant book, The Right Questions: Ten Essential Questions to Guide you to an Extraordinary Life. In the book she argues that in each and every moment we have the ability to choose our actions, thoughts, beliefs, and emotions. When you become conscious that you are overthinking, procrastinating, staying stuck in indecision or perfectionism you can make a different choice like I did. You can rewrite your fear story and step into the vision of your future life story. You don’t have to do this alone. Come share in the FB group Productivity for Creative Entrepreneurs what your current place of overthinking, perfectionism, or indecision is and ask for support and feedback. We grow faster when we grow together. Connection matters more than anything. ← Episode 109: To-Do Lists, Productivity Apps and Getting Things Done, Oh My!